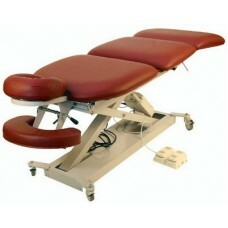 Massage table SM-21 Dream Spa, buy at the price of 1802 in Europe. For masseurs, beauticians and therapists, we advise to buy for their work modern massage table SM-21 Dream Spa with a durable metal frame. Conveniently there are numerous features, which facilitate the work of the expert: - all adjustments are carried out by means of pedals, which control the operation of electric motors; - all three planes of the table are tilt; - the mobility to move in the office; - different in color high-quality foam padding, almost 8 cm thick, with rubber inside for the comfort of any client.